Shakespeare wrote that a rose by any other name would smell as sweet. But if you cannot smell, does the rose lose its sweetness? The first and definitive book on the psychology of smell, The Scent of Desire traces the importance of smell in our lives, from nourishment to procreation to our relationships with the people closest to us and the world at large. Smell was the very first sense to evolve and is located in the same part of the brain that processes emotion, memory, and motivation. To our ancestors, the sense of smell wasn't just important, it was crucial to existence and it remains so today. Our emotional, physical, even sexual lives are profoundly shaped by both our reactions to and interpretations of different smells. Why do some people like a certain smell and others hate it? Is smell personal or cultural? How does smell affect our choices and our daily lives? Rachel Herz explores these questions and examines the role smell plays in our lives, and how this most essential of senses is imperative to our physical and emotional well-being. Herz investigates how our sense of smell functions, examines what purpose it serves, and shows how inextricably it is linked to our survival. She introduces us to people who have lost their ability to smell and shows how their experiences confirm this sense's importance by illuminating the traumatic effect its loss has on the quality of day-to-day living. Herz illustrates how profoundly scent and the sense of smell affect our daily lives with numerous examples and personal accounts based on her years of research. The wonders of our sense of smell are all explored in a compelling and engaging manner, from emotions and memory to aromatherapy and pheromones. 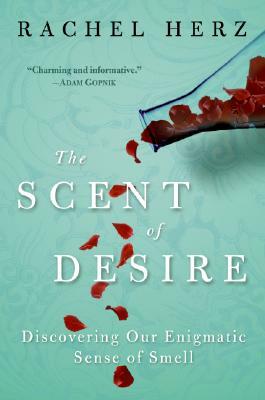 For anyone who has ever wondered about human nature or been curious about the secrets of both the body and the mind, The Scent of Desire is a fascinating, down-to-earth tour of the psychology and biology of our most neglected sense, the sense of smell. Since 2000, Rachel Herz, Ph.D., has been on the faculty of Brown University. She has appeared on the Discovery Channel, ABC News, the BBC, National Public Radio, and the Learning Channel, and is the subject of a Scientific American profile piece.